This post was contributed by Dr Sophie Hope, Lecturer in Arts Management in Birkbeck’s Department of Film, Media and Cultural Studies. Today, students and graduates are expected to be nurturing their entrepreneurial selves; moulding themselves into the brand that will appeal to prospective clients or employers. Students are often pressured by tutors and peers to carry out extra-curricula voluntary activities to help improve their ‘employability’. Universities are taking their responsibility in producing work-ready students more and more seriously by revamping careers advice, embedding work placements and offering recruitment services. The purpose and nature of university education is changing. In the creative industries and arts sectors, employers offering regular or permanent jobs are few and far between, rather, students embark on a flexible, freelance, portfolio career which in reality involves a lack of separation between work and non-work, no pension, no sick-pay or other employment rights. Because the work is supposedly creative and you are ‘doing what you love’, you are expected to express gratitude and enthusiasm for the ‘opportunity’ to be entering into such a career path. A love of and commitment to the work is often used as an excuse for little or no pay. Within the context of academic study, ‘employability’ is often approached uncritically and in a vacuum, disconnected from the theory, history and politics of the changing realities of work. This is happening in a context where enquiring minds are supposedly being nurtured. Critical, independent thinking practiced in the university and efficient project management and communication skills expected in the job market have a difficult, contradictory relationship. Welcome to the world of credited work placements. The fragmented career structures of graduates together with this disconnect between employability and critical thinking advocated by the academy were both triggers for my colleague Lorraine Lim and I to think about how work and education intersected in a university context. Through our research, which led to the Critical Work Placements resource, we found that employability is a luxury not all students can afford. Indeed, students undertaking placements tend to be a self-selected group who are motivated, engaged and in the case of self-organised placements, are also expected to be confidently networked so as to know who to contact and how. Our research aimed to explore what a ‘serious, ethical, substantive academic’ period of work experience might look like for students, tutors and employers in the arts, and if this is at all possible. The resulting ethical tripartite agreement, developed with students, hosts and tutors, is a practical toolkit of flow diagrams and recommendations for students, host organisations and placement tutors working in higher education. The case studies we looked at demonstrated a spectrum of approaches, from students self-organising their own placements to tutors working with partner organisations to ‘marry’ students to specific projects. The reasons for this range of approaches depended on the learning objectives of the course and resources available to the tutors to act as brokers and ‘relationship managers’ between hosts and students. While this diverse range of approaches is necessary because of the specifics of each course, it was pointed out that some support for those students who are not networked or confident in approaching potential hosts should be supported by the tutor, although it is recognised that this has resource implications for the department. Based on our review of existing literature, we found that well informed students and courses that explicitly connect the concepts, theories and realities of employability through practical experience and academic, critical reflection are perhaps a way forward. There is increasing pressure from both students and managers in higher education to provide credited work placements, but the realities of placing students in organisations to carry out a specific project related to their academic learning is becoming more difficult. While there are some funded programmes supporting students from disadvantaged backgrounds to access placements, those students who do not qualify for this support but cannot afford to take up unpaid work placements continue to be at a disadvantage. The sector remains distinctly un-diverse. Placements are often reliant on the goodwill of people in those organisations who decide to invest their precious time and resources to provide necessary support to the student. Similarly, well-run credited placement programmes involve significant work-load for tutors and unless a university can provide the necessary paid staff-time to support students, running such programmes might be detrimental to their reputation and sustainability. Writing about the proliferation of credited work placements in the US, Ross Perlin writes that “universities are falling over themselves to outsource their students’ education and lend credibility to illegal employment practices”. He provides examples of credited placements which involve envelope stuffing and leafleting. In the development of the Critical Work Placements website we took the position that students carrying out work that is far removed from their academic experience should be paid. Where students are paying to carry out work experience through university fees, the payoff has to be a rigorous, critical, reflexive, well-supported learning experience. It was recognised that placement students are not workers and that the placement is part of a broader, formal learning process, the outcomes of which will depend on what skills and learning the student wants to get out of it in relation to the course they are studying. The need to strike this practice/academic balance is central to the debate over credited work placements. This resource aims to provide a framework for that debate which students, hosts and tutors are invited to engage in. Equality Challenge Unit. 2010. Work Placements in the Arts and Cultural Sector: Diversity, Equality and Access. London: Equality Challenge Unit/ Institute for Policy Studies London Met. Perlin, R. 2011. Intern Nation. How to earn nothing and learn little in the brave new economy. London: Verso. Yorke, M. 2003. Employability in higher education: what it is – what it is not. London: Higher Education Academy. Barrow, R., Behr, C., Deacy, S., McHardy, F. and Tempest, K., 2010. “Embedding Employability into a Classics Curriculum: The Classical Civilisation Bachelor of Arts Programme at Roehampton University.” Arts and Humanities in Higher Education, Vol. 9, p. 339-352. This blog was contributed by Helen Lawton Smith, Professor of Entrepreneurship, Director, Centre for Innovation Management Research, Department of Management, Birkbeck. Nearly 300 people — academics, policymakers and business practitioners — from 35 countries attended the beginning of the 2013 Triple Helix International Conference yesterday. Why did they travel from across the globe to the three-day event hosted in Bloomsbury by the Big Innovation Centre, Birkbeck and UCL? The second is that they came to network. This is the best bit of every conference. Who knows who you will sit next to on the river cruise, at the dinner at Lincoln’s Inn or in a parallel session or workshop? The third answer is that they came to hear outstanding speakers. They came to listen to the originators of the Triple Helix metaphor, Henry Etzkowitz and Loet Leydesdorff, and David Willetts, Minister of State for Universities and Science, and Will Hutton, the political economist and writer. They also wanted to hear from other distinguished keynote speakers from high-profile organisations, including the European Commission, the OECD, Unilever, EDF, GlaxoSmithKline, about the relevance of the triple helix model to their thinking and practice. What three things will they have learned? 1.That the triple helix model is continuing to be central to the economic, social and technology policy agenda in many countries of the world, such as Brazil and Russia, and to international bodies, such as the European Commission’s Europe 2020 Smart Specialisation agenda. Alongside this is an increasing interest in how the impact of actions which follow from the agenda can be mapped, measured and evaluated in order to identify baselines for policy decisions. 2.That the model is not so much mutating but changing the forms it takes in the relationships between actors. Its inter-relationships are key to businesses, such as Unilever. In the cloud industry the basis of innovation in the market place is changing and requires a ‘convergence of capabilities’. Whether this counts as ‘open innovation’ is a debate that will continue long after this conference. An emphasis on the broader role of universities in the economy includes employability, an agenda which links all three of the spheres. This can take the form of entrepreneurship education, both formal through teaching programmes and through student and alumni support such as Birkbeck’s Enterprise Hub, and the mentoring programmes organised by Birkbeck’s Entrepreneur-in-Residence, Andrew Atter, based in the Centre for Innovation Management Research in the School of Business, Economics and Informatics. Professor David Latchman, Birkbeck’s Master, is himself an entrepreneur and believes that there should be more entrepreneurship. Changing forms present challenges including the ever-present need for finance for entrepreneurs and innovation, and for universities to maintain their standards and diversify their activities to be more responsive to society’s needs. 3.The triple helix model is also a political agenda. It takes a variety of meanings depending on context for each of the three spheres in an uncertain world, nationally, regionally and locally. Whether the model will unravel will depend on how mismatches between the institutional arrangements in each of the three spheres are resolved. The coordination problems are considerable. Moreover, it is an issue of prioritisation. How the different stakeholder interests fit with the increasing pressures on universities to recruit students and enhance their learning experiences is a question yet to be answered. This Thursday 28 June, as part of the School of Business, Economics and Informatics‘ annual Business Week, Professor Helen Lawton Smith will be holding an event on entrepreneurship. Prior to the event, Professor Lawton Smith explained to us how university spin-offs in London are faring. The Coalition government has recognised, in policy announcements and ministerial speeches, that the creation of new jobs and economic growth is key to the recovery of the UK economy. In both the UK and the USA, studies have shown that it is new companies, rather than established firms, which are leading the creation of new employment opportunities. Universities, with their wealth of knowledge and highly skilled staff, have a lot of potential for commercialising their research through spin-offs. What’s more, London, a global city and home to 42 universities, offers an attractive environment in which to launch new spin-offs. Metropolitan regions, such as London, offer many advantages to the new spin-off: they attract a highly skilled workforce, the high concentration of large and international companies means there is a market for products commercialised by universities, and they provide resources in the form of services companies (offering technical, commercial and marketing know-how), physical infrastructure and strong telecommunications networks. Given that any fresh young company needs a market, a talent pool, and access to financial resources, London appears to be a highly attractive location. However, Lawton Smith explains, one important factor for new companies is the support of regional knowledge networks. In large cities, including London, although resources may be available they tend to be accessed less by spin-offs than in other regions of the UK. Lawton Smith explains that, despite its obvious advantages, London’s ‘entrepreneurial system’ (networks, research universities, professional services and skilled labour) was not well developed, even by the mid-2000s. It seems that during this period, most London universities were not embedded in any networks, possibly, suggests Lawton Smith, due to the sheer quantity of organisations involved in London’s financial community. In smaller regions these sorts of networks may be more transparent, and easier to tap into. This situation is beginning to change. Imperial College has launched a £300 million venture fund – Imperial Innovations – which was listed on the AIM stock exchange in 2006. Imperial Innovations, which already has equity holdings in 80 companies, is now looking to invest in other universities’ spin-offs. Other promising advances include the London Development Agency’s (LDA) commitment in 2005 to improve the infrastructure to support university spin-offs in the capital; London’s Science and Industry Council now brings together players from industry, academia, finance and the public sector to promote London’s strengths in science, technology and design to a national and international audience; the London Economic Partnership (LEP), established in 2011 will be taking a broader approach to supporting innovation and enterprise; and the Regional Growth Fund (2011 – 2014) is also being directed towards support for entrepreneurs. It is too early to tell whether these changes will have an effect on the number of university spin-offs which chose to launch and remain in London. 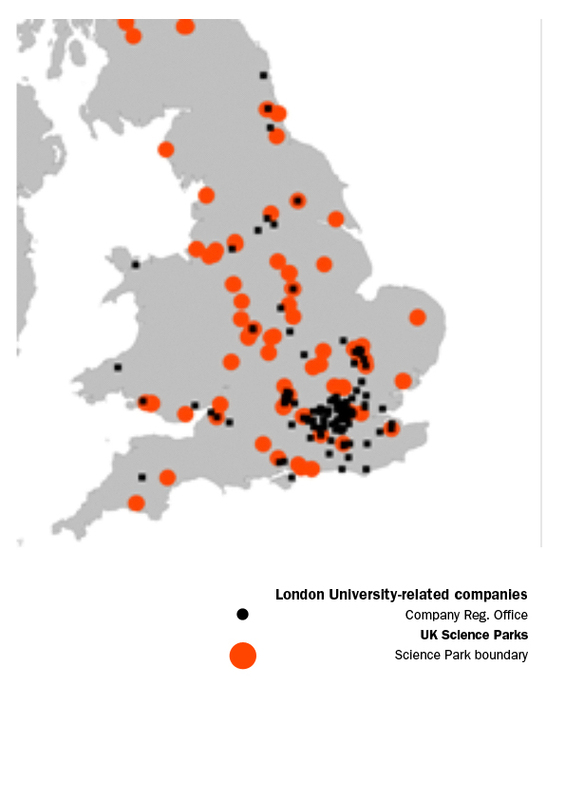 Currently more than a third of London university spin-offs leave London at start-up or a later date. Lawton Smith explains: “Applications of technological advances may take place outside London because of problems of supporting spin-off growth within the city. 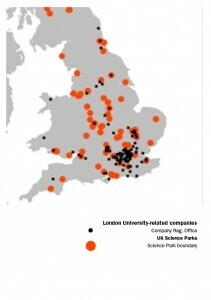 The regional impact of university spin-offs extends well beyond the metropolitan region.” Indeed, a map showing the location of registered offices of London university spin-offs shows that they are spread well beyond the capital. However, other success measures aside, if university spin-offs are to play a part in the UK’s economic recovery, the Government’s primary interest lies in their ability to create employment, and it seems that here university spin-offs do not compare favourably with corporate spin-offs, which expand at ten times the rate of their university counterparts. Looking at the chemical sector (which has the third highest concentration of university spin-offs in the UK after pharmaceuticals and biotechnology, and software and computer services) Lawton Smith suggests that, “many spin-offs are launched as a vehicle on which to focus further research, rather than genuine attempts to set up spin-out companies which take invention to full commercialisation.” Many of the companies which the Royal Society of Chemists looked at in a 2006 study were based on a single idea or patent, which meant that they had little hope of long-term viability. Although few of the older spin-offs have reached a substantial size, the Lawton Smith et al study showed that those spin-offs which have shown the highest growth have been those with the most recent origin. 60% of those which achieve high growth do so within five years of incorporation. These companies are known as ‘Gazelles’. Despite this, only a small proportion of the 244 firms identified from 12 London universities in Lawton Smith’s et al’s study achieved high growth. Although it is clear that there are areas where London’s universities could do more to support spin-offs, and that the capital offers challenges, as well as opportunities, to new companies, Lawton Smith says that there is positive news. High growth university spin-offs outperform other high growth firms by 0.8%. And survival rates are high, particularly for staff start-ups (using IP from the university but without university funding or support). Lawton Smith concludes: “If the Government, LDA and LEP are truly dedicated to supporting innovation and entrepreneurship in London, then all the evidence shows that they need to provide sustained capacity building for dedicated entrepreneurial support systems. The advantages of co-location with the originating university will be outweighed by the disadvantages of a lack of accessible premises, networks and professional service firms unless the Government can meet the challenges it faces in this area.